Voting is now open. 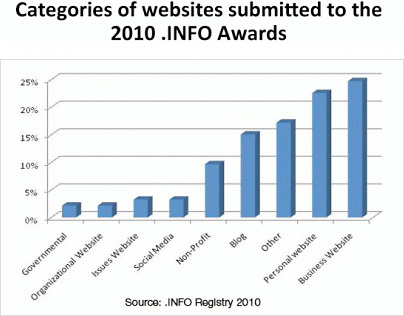 Top 10 nominees for the .INFO Awards are revealed.Today, Afilias, a global provider of Internet infrastructure services and the registry operator for the .INFO top-level domain (TLD), announced that the 2010 .INFO Awards is now open for public vote. Anyone around the world can now vote for their favorite of the top 10 .INFO nominees selected by a panel of judges. Each voter will also automatically be entered to win a new Apple iPad. "With over six and a half million domain names and millions of live sites, .INFO is the home of information on the Web and we look forward to the opportunity each year to reward the best .INFO sites out there," said Roland LaPlante, Chief Marketing Officer for Afilias. "Now you have the opportunity have a voice in the program, and show your support for your favorite of this year's nominees." The 2010 panel of judges included seven distinguished individuals from the online, media and technology industries. They included: Dominik Grollmann, editor in chief, Internet World Business (Germany); Grant Allaway, group managing director, AD2ONE (UK); Peter Prestipino, editor in chief, Website Magazine (US), Liam Eagle, editor in chief, the Web Host Industry Review (Canada); Anand Parthasarathy, editor, IndiaTechOnline.com (India); Katy Tafoya, creator and editor, ConstantChatter.com (US); and Philipp Grabensee chairman of the board, Afilias (Germany). Over 130 sites were submitted from over 20 countries for this year's Awards. Entries spanned a number of categories including: business websites (25 percent), personal websites (23 percent), blogs (17 percent) and non-profit websites (10 percent). Members of the public can vote for their favorite of these top 10 sites at www.info-award.info now. Public voting will remain open until 11:59 p.m. ET November 2, 2010. The public votes will be combined with the judges' scores to select the top 3 winners, with first place being named the "Best .INFO website of 2010." Prizes for the awards are allocated as: US$7,500 for the winner, US$5,000 for second place, and US$3,000 for third place. In conjunction with the announcement of the Award winners, one voter will be chosen at random to receive an iPad. Local Time: Friday, April 19, 2019 03:29 AM PDT – Page Load: 0.3717 Sec.